The ultimate guide to Crystals and how to use them. 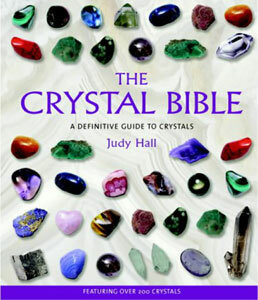 Internationally best selling author Judy Hall presents a comprehensive guide to more than 400 powerfully healing Crystals and Stones. Plus information about more than one hundred and fifty newly discovered stones. The Encyclopedia of Crystals is organized by color for easy reference. Beneficial for Profound healing at the cellular level, macular degeneration, herpes, bronchitis, skin, convalescence, emotional body, self pity, anxiety, realistic goals, emotional trauma, grief, stamina, nervous and immune systems, dehydration, brain, thyroid, liver, gall bladder, adrenal glands, self-esteem, integrity, sensitivity, focusing goals, muscles, muscles pain, bones, metabolic system, as an elixir, it softens the skin. Composed of Aegirine (see page 102 for generic properties) potassium feldspar, Quartz (page 230), riebeckite, Acmite, Arfedsonite and Zircon. 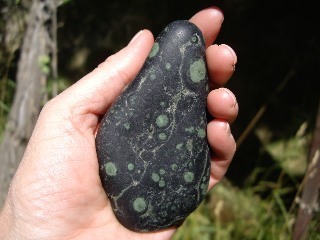 Nebula Stone is said to have unique Metaphysical properties. The light vibration of Quartz is transferred into the physical body, enlightening the cells and activating their consciousness, raising overall awareness and bringing remembrance of the souls roots. The feldspar constituent assists in letting go of the past and moving confidently into the future, at the same time understanding underlying feelings. Gazing into a Nebula Stone takes you outward into infinity and inward into the smallest particle of being, until, ultimately the two become one. 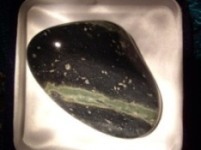 This stone accesses the Akashic Record and facilitates Aura readings. A stone of non-duality and Oneness. It increases self-awareness and self-love. Nebula Stone blends the vibration of light carried in it's Quartz component into the physical body enlightening the cells and activating their consciousness. This raises overall conscious awareness, bringing remembrance of the souls spiritual roots. 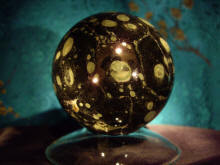 Gazing into a Nebula Stone takes you outwards into infinity and inwards into the smallest particle of being. Ultimately the two become one. This is a stone of non-duality and oneness. 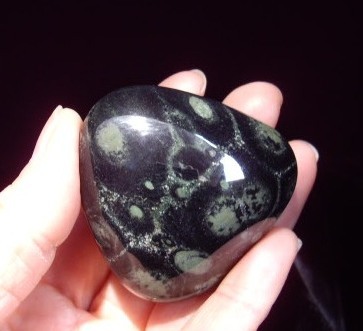 Nebula Stone can bring about profound healing at the cellular level of being. that qualifies it to be called the first outer space scenic stone." The industry standard for Gemstones. Ask about Gift wrapping and sending direct to recipient! 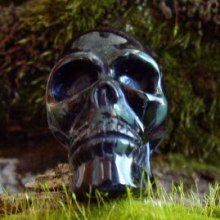 Newly updated: The Discovery of Nebula Stone "The Enchantment of Nebula Stone"
Please go see the New TV Cosmos series on Fox TV. * We are not set up for online shopping cart buying... so please call or E-mail us for a purchase. Everything is Reborn and Continues"
If you wish you may share our link with others, just copy and paste www.nebulastone.com into your email. Privacy: We do not give, sell, trade nor share any of your info!! It’s your stuff. Color and appearance will vary depending on your monitor and settings. Crystals and Stones are not a substitute for medical treatment. 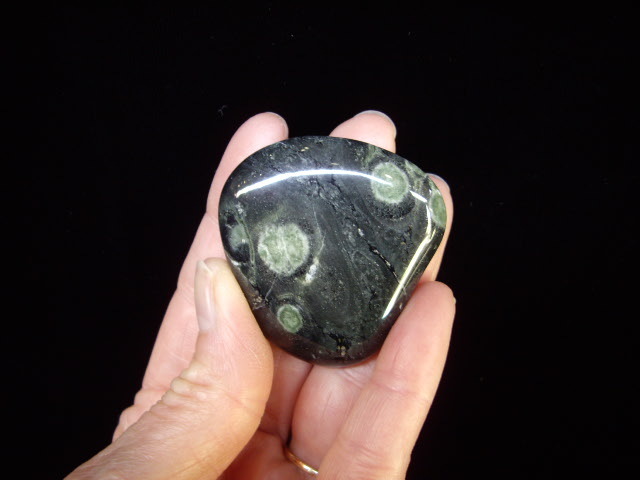 Nebula Stone makes no claims, and is not intended to diagnose, treat, cure, or prevent any disease. If you need help in any way please consult your doctor or other health care practitioner regarding health issues. the sole source of all Nebula Stone™ or related Nebula type stones.